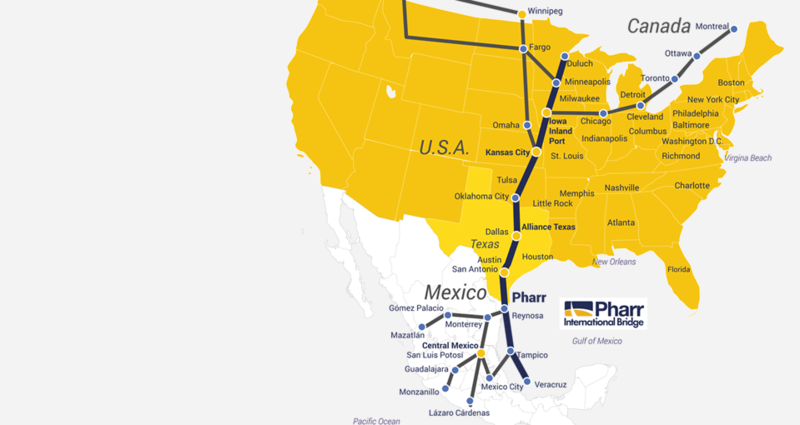 Located at the intersection of key international trade and transportation corridors in every direction, Pharr is one of the most attractive logistical points in South Texas. Our city is a main point of entry for trade, providing air, sea, and land access to international and domestic markets. Pharr is conveniently centered on the intersection of Interstates 69C and 2. North-south freeway access to interstates 37 and 410 is available on U.S. Route 281, a highway that runs from just north of the US-Mexico Border to the Texas-Oklahoma state line. Pharr also provides convenient access to U.S. Route 83, the longest north-south highway in the United States. The Port of Brownsville is approximately 50 miles east of Pharr. It serves South Texas and much of Northeast Mexico. This port is the only deepwater port located on the US-Mexico Border. With abundant land for development and 17 miles of waterfront land, it offers easy access to rail connections, roadways, and the Pharr International Bridge. Domestic and international companies have found the the Pharr-Reynosa International Bridge gives businesses great advantages. Located only five minutes away from two international airports, the Pharr-Reynosa International Bridge can ensure that your business will get where it needs to be. Whether your business is in the transportation industry, or you need to distribute inventory quickly, businesses can go further in Pharr. Companies that choose the Pharr-Reynosa International Bridge also benefit from the lowest toll rates in Texas. Located only five minutes away from two international airports, the Pharr-Reynosa International Bridge can ensure that your business will get where it needs to be. Please fill out the contact form to send us a message.